* Inclinations and eccentricities were personality characteristics... not related, necessarily, to planets. * Geocentric plane geometry was perfectly adequate for most purposes. * Astrologers tended to be priests... whose words were somehow more sacred, and thus, smart alecks, skeptics, and/or critics did not have to be tolerated. * Statisticians were a plaque reserved for the far future. * The range of latitudes and longitudes were limited to “civilization”... ze local valley. * Vacated locations in space still carried weight (i.e. mass) and influence. * Software was used exclusively for virgin sacrifices, priestly benefits, and so forth. The GOOD news for modern astrology is that the importance of geometry and the ancient dictum of “location, location, location” has been acknowledged and reaffirmed. One point for astrology! Astrologers, in response, grabbed their bootstraps and rose to the challenge, incorporating the three new planets, adding Chiron (a comet in a planetary orbit?) to its mythological maverick description, electing to pretty much ignore the moons of five planets, and for the believers in diversity, developing an ephemeris of most everything, including some 10,000 asteroids. Astrology furthermore proved its creativity when it also rationalized a theory that any planet, moon, or whatever, not previously known to astronomers (and thus to astrologers) did not have nearly the same profound effect on human consciousness as they did when humans became... well... conscious of them. (Thus, if you don’t know about them... you can ignore them; what you don't know, can't hurt you.) With one brilliant stroke, any lack of previous knowledge could not be used to discount current knowledge. AND if all of these coincidences are not just happenstance... then there must be something to account for the very selective orbits, ratios of planetary/satellite size, and so forth and so on. Geometry, of course, arises as one of the main contenders... even as an aspect of consciousness or other factors. In effect, science had been found somewhat lacking in this regard, and simultaneously, astrology had appeared to be prescient, if not precognitive. The recognition of geometry quite possibly being highly relevant was great news for Astrologers, as their lonely cries in the wilderness about the geometry of the planets being so all-fired important, was now being... confirmed? There was, of course, the pesky nonsense about planetary and orbital inclinations and/or eccentricities. This was detrimental to the exclusive use of plane geometry as the means of explaining any and everything. The idea that from either a heliocentric or a geocentric point of view, the fact remained that an alignment based on Right Ascension (RA) was perhaps insufficient without a like concern with Declination. The gauntlet of scientific precision had been thrown in astrologer’s face. But again, Astrologers rose to the occasion and invented the “orb”... suspiciously similar to the traditional plus or minus error of mathematicians (e.g., Finagler’s Theorem, Fudge's Factor, and so forth). Thus any slight discrepancy in the determination of an astrological square, trine, sextile, opposition... or even a conjunction could be pretty well relegated to the unnecessary nit-picking pile. Missing a fateful meeting of your twin flame by a day or two would NEVER be a problem... if only because of the diversionary bliss enjoyed by you and your newly instituted love interest. These mathematics are VERY curious, coincidental... and probably very meaningful. And I hope you’re taking notes, because there will be a quiz later on! But then things began to get really complicated. 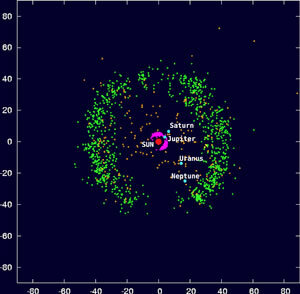 The well behaved behavior of Jupiter’s 16 satellites... so beautifully organized into four groups of four... was suddenly confused with the discovery by science of an additional 50 NEW moons of Jupiter. Worse yet, the recent additions were a jumble of high inclinations, increased eccentricities, and worst of all, the latter bunch were all in a retrograde state. The Plane Geometry Assumption (PGA) was suddenly put into jeopardy. NOW, we had a Mother and her well behaved children (the ones closest to her)... and alas a host of crazed black sheep of the family further out revolving in all sorts of tilted orbits. With Saturn, if anything, it got even worse. There were, of course, the well-behaved inner circle (pardon the pun) of 22 moons, all well-behaved... and well... maybe not. There was, for example, Janus (discovered in 1966), found to be co-orbital with Epimetheus in 1978-1980, and officially named in 1983 for the two faced god of Roman lore. And then the maverick of all mavericks... Iapetus... the Moon with a View. AND THEN, way beyond Iapetus was another forty or so new moons... of which the outermost 21 were retrograde... assuming that some did not do some sort of bumper car routine with one of their mates. Iapetus was extraordinary... a clear case of black and white (pardon the pun)... but still not typically part of astrology’s bag of tricks. Perhaps it could be ignored. Which Astrology promptly did. After all, in the past, astrology had seldom concerned itself with the moons of any planet other than earth. Nevertheless, there was the prescient notion of “inconvenient truths” that had to begin to niggle at the sleep of astrologers. And in fact, they did not have long to wait. With the new millennium came the news of new planets... not some mere tenth (of “12th“) Planet... but a “bunch”... a scientific term... of new planets. 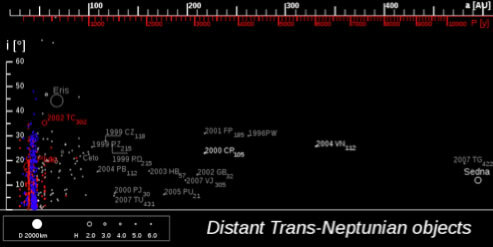 The population explosion of planets just past Neptune (technically, “Trans Neptunian Objects") accounted for a quick addition of seven or nine members before Astrology had a chance to catch its breath. One important comfort factor was that all the newcomers had much longer orbital periods, and thus could be deemed “generational”, and would not necessarily require too much detail on a personalized natal chart. Simultaneously, the IAU was providing names... based on mythology... and thus giving Astrology the opportunity for more speculations on personalities, characteristics, and possible influences... It was surely a Brave New World for astrologers... or at least numerous brave or cowardly new worlds (based on their relevant myths). For example, Sedna was an Eskimo goddess, dwelling at the bottom of sea, and could be easily identified with COLD!, not to mention going off on a long tangent. There was also the Haumea, Makemake, et al... with lots of good interpretations, and with periods of “only” about 280 years... these were "influences" that could be handled... generation wise. Unfortunately, before most astrologers had begun to mine this new treasure trove, the TNO (or KBO -- Kuiper Belt Objects) population explosion went ballistic. There were planets everywhere! Note, for example, Sedna. Well beyond even a hypothetical Nibiru. But with most everyone basically overwhelmed by the many, many new kids on the block... even if astrology had managed to deal with 10,000 asteroids to some degree... and with “Rogue Planets” to add a bit of spice... there was the demotion of Pluto. The nonsensical “dwarf planet” category was bad enough... and possibly doable, if only because Ceres, et al could also be so assigned... and they’ve already been dealt with. What in fact really began to show some serious cracks in the modern astrology’s foundation was that Pluto... long vaunted for all its profound and astounding influences on the many generations of man... had other planets claiming similar if not equal honors. Pluto had looked so good with Uranus and Neptune giving the First TNO such a boost with the Golden Mean relationship, addition of orbital periods and the like. But now Orcus and Ixion had arrived like long lost brothers, who had never been acknowledged, but with enough credentials, birth certificates, DNA analyses, and the like, that SUDDENLY THEY HAD TO BE ACCOUNTED FOR AS WELL. You were born with Pluto in Scorpio? Cool. And where were Orcus and Ixion? Ow! AND what about their transits, aspects... and so forth. Where’s the new astrological software? Pluto had always been a bit of a challenge to astrology with its eccentric ways, including a 17.5 degree inclination. The plane geometry assumption was really getting pushed hard. But many of these other dwarfs were true Eccentrics. Take Eris, for example. Then, there is something called astronomical transits. That’s astronomical... not astrological. We’re getting really, really scientific here. This kind of transit is where one (or even two) planets cross the face of a third object as seen from an outer planet. A PREDICTION OF A FUTURE WAR! Or Eris’ next nodal, disruptive crossing in 2075.